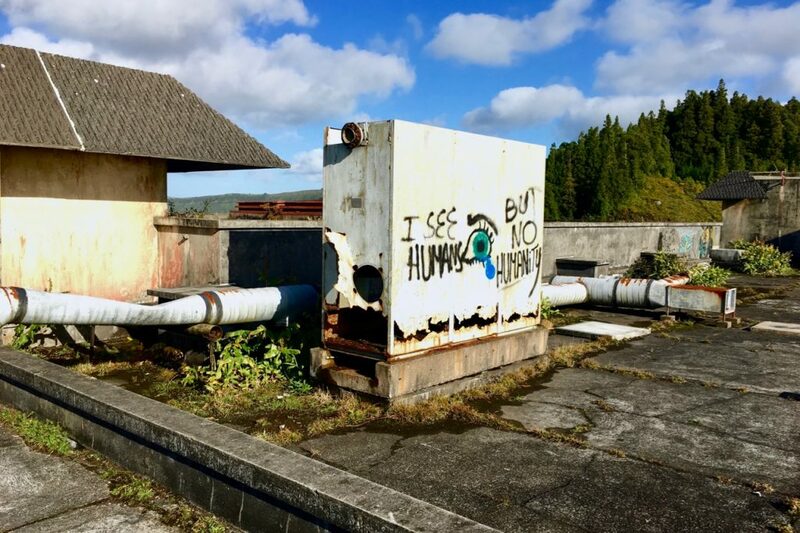 The once-luxurious Monte Palace Hotel was constructed in the 1980s by a French firm hoping to capitalize on beautiful views of Lagoa das Sete Cidades–the twin green and blue volcanic lakes that have come to symbolize the splendor of the Azores. 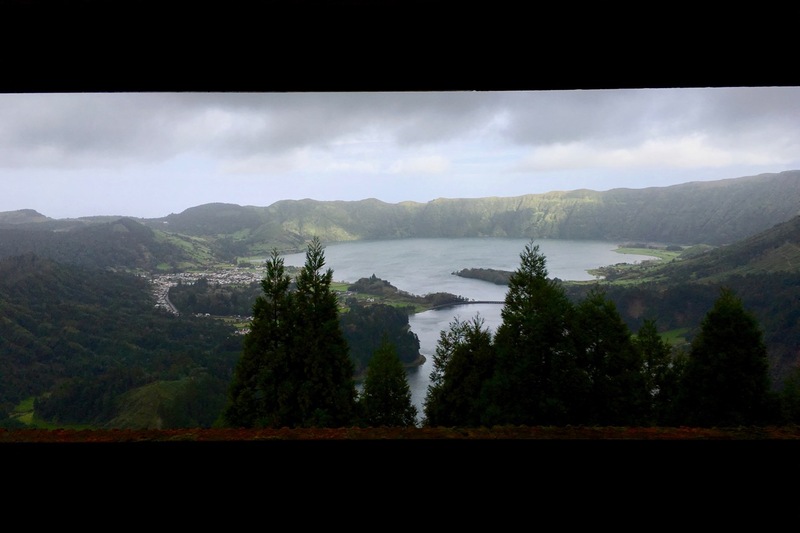 A hotel may not seem like a terrible idea now, but the Azores’ tourism industry was almost non-existent in the 1980s. Tourists wealthy enough to stay in such an opulent place were just not coming to the island. 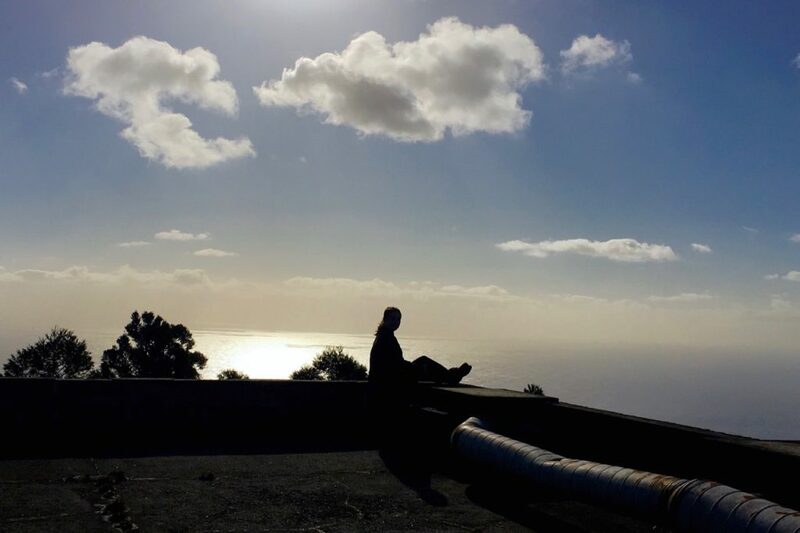 Limited infrastructure on the island made Monte Palace difficult to reach, and its theoretically beautiful location wasn’t enough to bring visitors there. 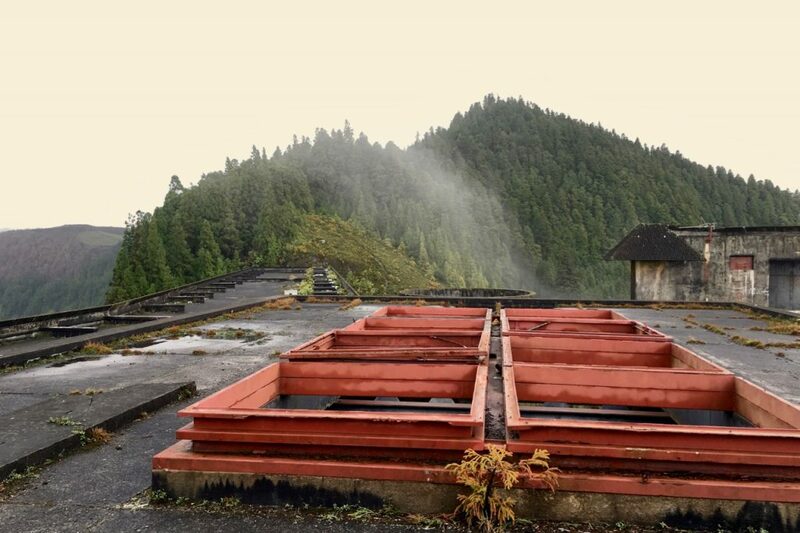 The weather at the top of the volcanic caldera is notoriously unpredictable, with fog covering the summit most days of the year–and blocking the view the hotel was trying to offer. 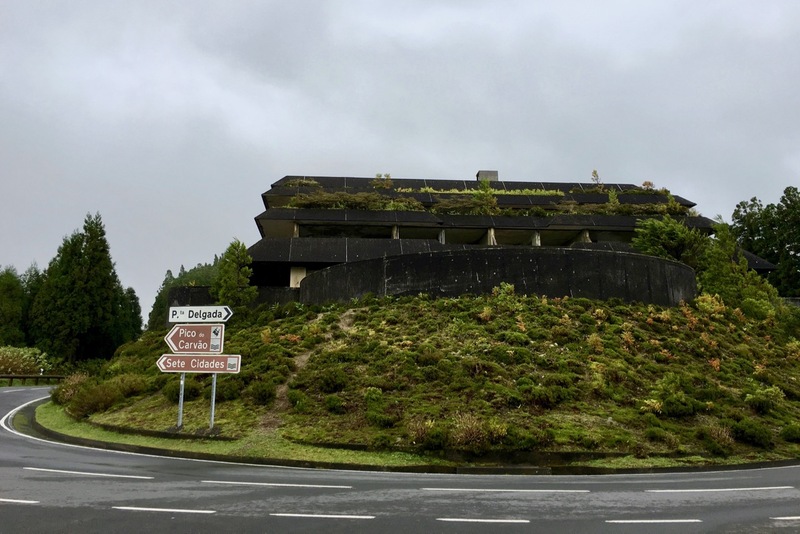 After eighteen months with few visitors, Monte Palace’s owners became unable to keep up with their creditors, and the hotel was shuttered. For the next decade or so, the owners paid for armed guards and dogs to watch over the structure and its amenities, keeping out looters and trespassers. 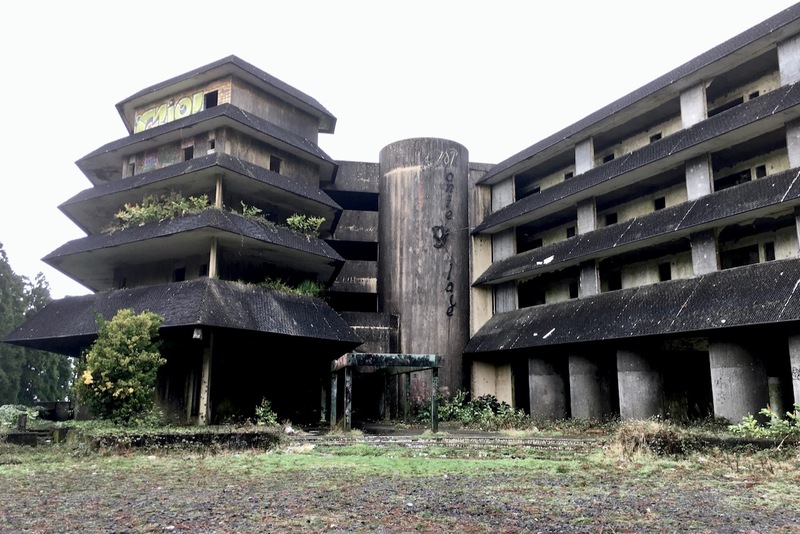 Even that became too expensive, and the owners eventually gave up on saving the hotel. Left unguarded, Monte Palace was open to anyone who wanted to take a piece it. It wasn’t long until all the windows, doors, and fixtures had been scavenged. 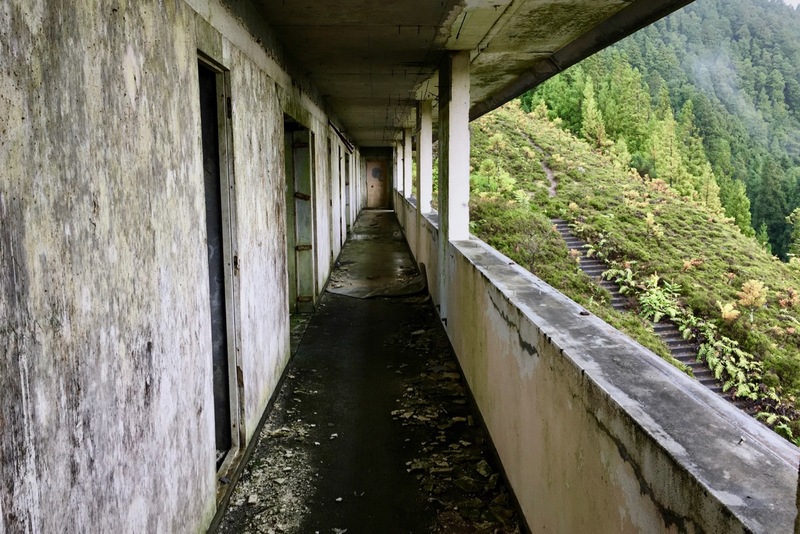 What’s left is a shell of a once great, if ill-conceived, hotel, now open to urban explorers, hikers, and adventurous tourists. 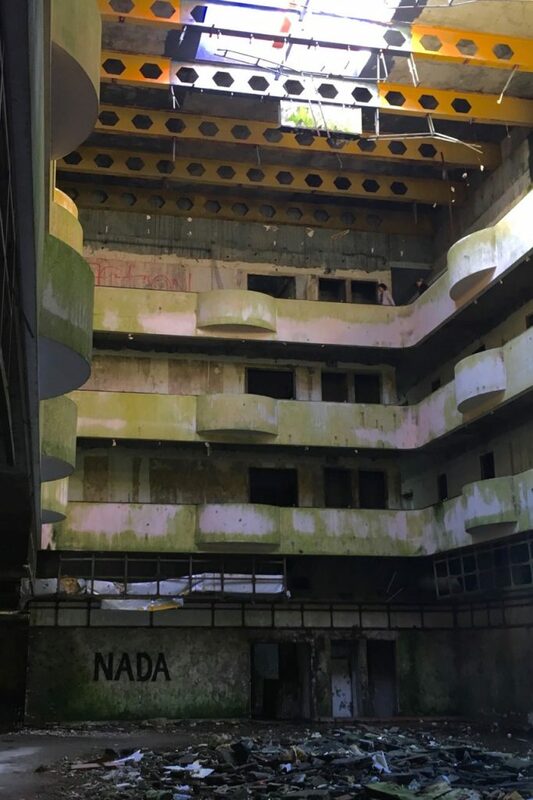 There’s something beautiful about an abandoned building like this. 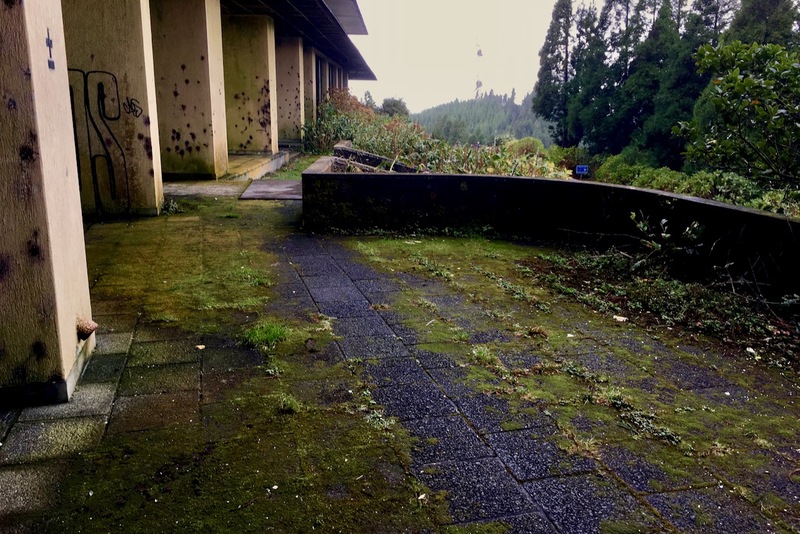 I don’t think the hotel’s concrete structure will be falling away anytime soon, but it’s amazing to see nature reclaim its territory. 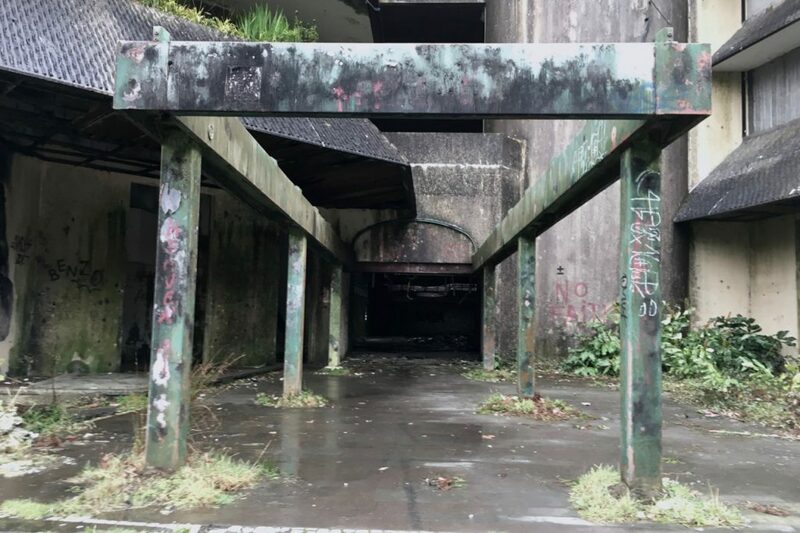 Despite all the engineering marvels that have been made and the synthetic materials used to build structures, nature has a way of creeping in and taking over. Dirt blows through, making a foothold for plants to grow. Algae and lichen coat the walls, providing a new and more natural façade. Animals find a home in the spaces that humans have vacated. 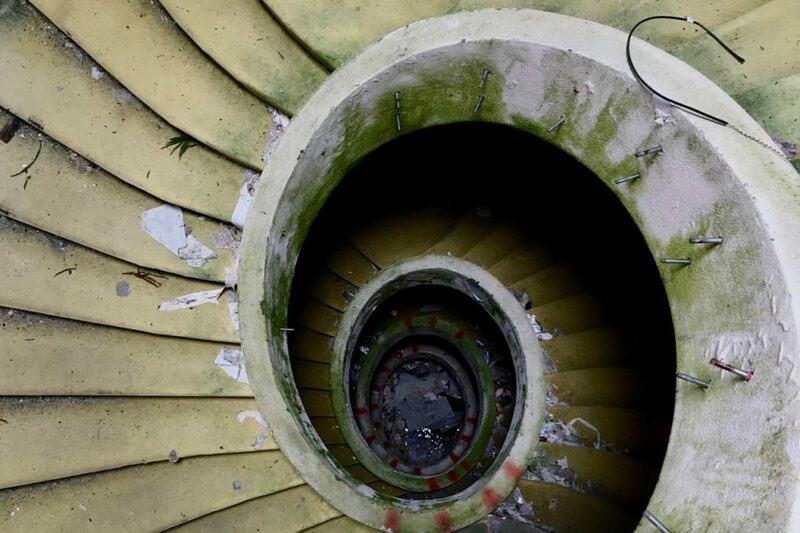 Abandoned structures like Monte Palace remind us of the fragility and impermanence of the things we toil to create. In some ways, it’s disappointing this hotel never succeeded. The views are amazing on the rare clear days, with one side facing the Atlantic and the other overlooking the lakes. Having scrambled up to the rooftop, I can say the hotel may have the most beautiful view on the island. 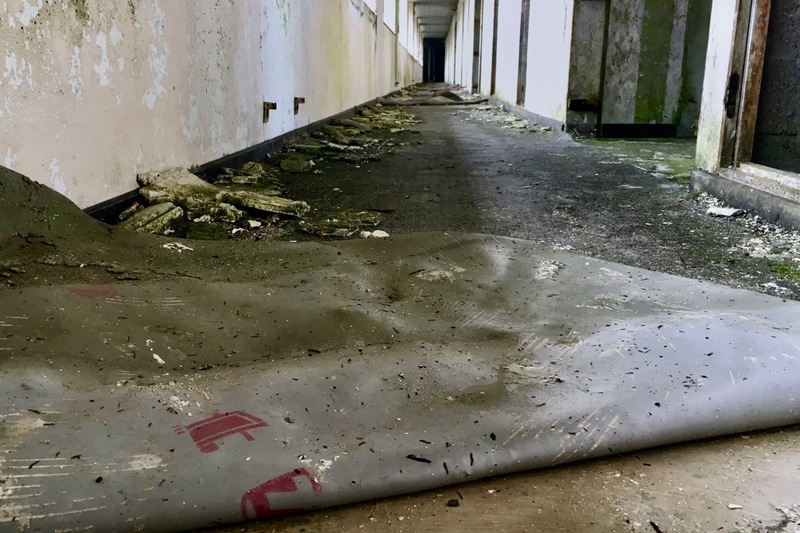 On the other hand, I’m also grateful there are still some spaces that have not been tainted by the development of tourism. 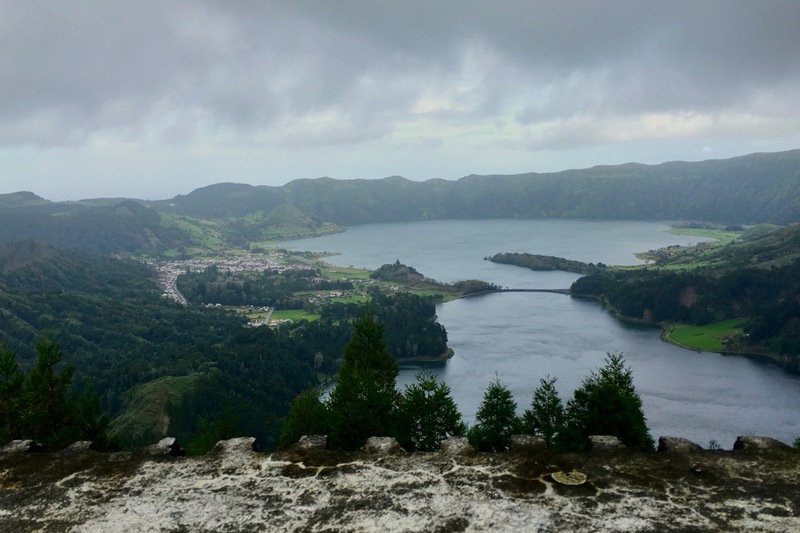 The town of Sete Cidades has a few restaurants, but little else to make it a tourist hotspot beyond its magnificent vistas. Perhaps the perpetual fog that limited Monte Palace’s success protected Sete Cidades from the rising prices that can affect local people when luxurious hotels pop up. 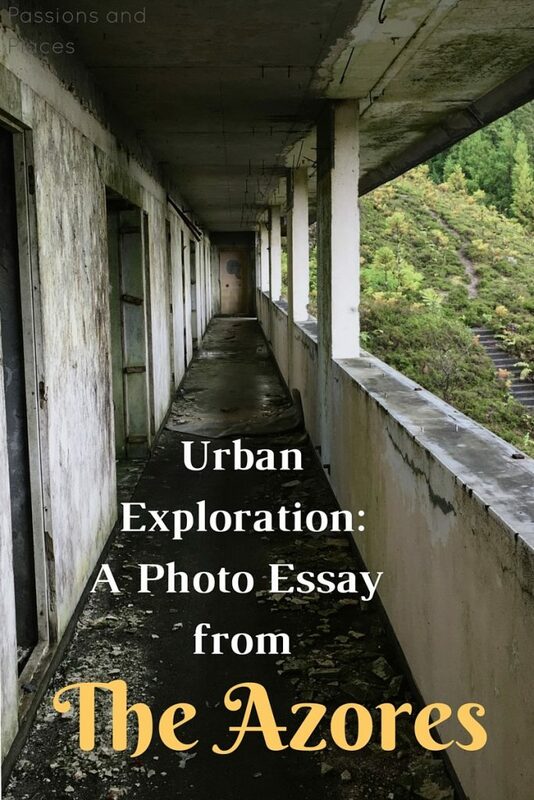 In the U.S., urban exploration is often illegal. Property owners have a greater responsibility for what happens on their land, and they can be held liable for any injuries if they don’t make a strong effort to prevent trespassers. 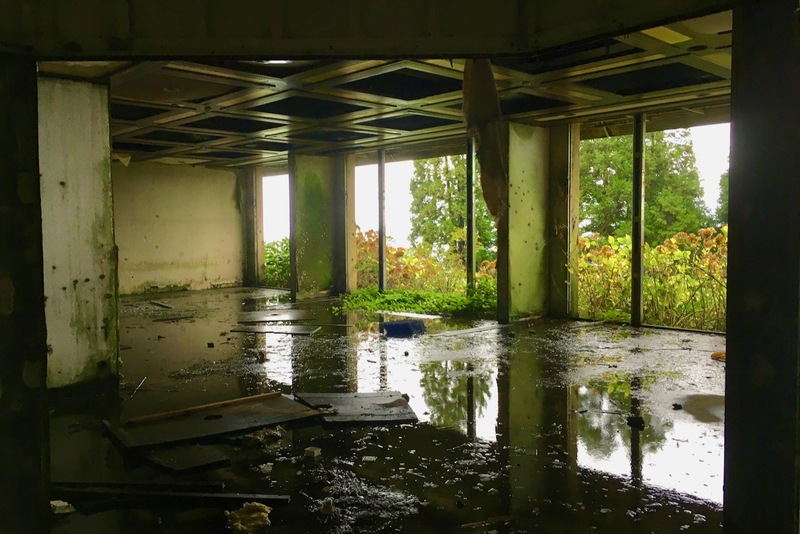 That’s not to say that urban exploration is impossible here, but there are fewer opportunities. Wear thick-soled shoes to prevent shards of metal or glass from penetrating them. Step carefully, look before you touch, and stay aware of your surroundings. Even with an iPhone flashlight app, I was unable to explore the basement of the hotel without a proper flashlight. You’re here for the experience and the photographs. While some graffiti artists have done amazing work like The Freedom Tunnel in New York City, altering the site (intentionally or unintentionally) can diminish the experience for other urban explorers. 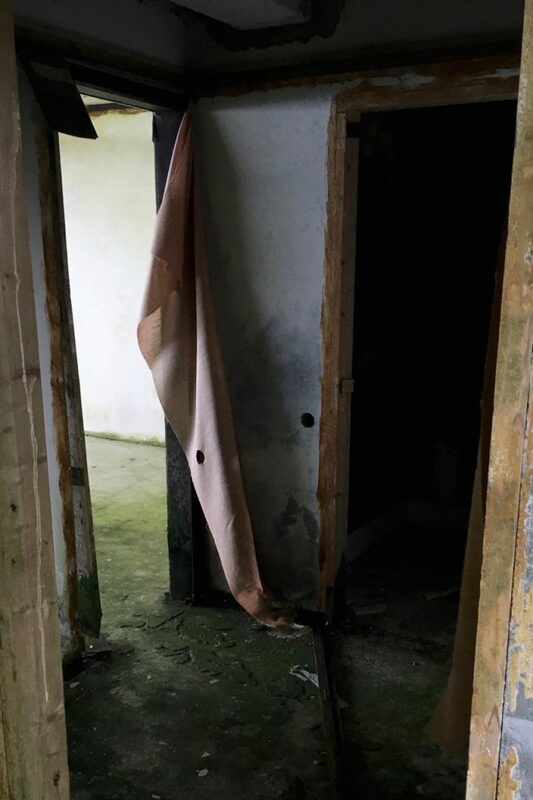 When exploring abandoned buildings, it can be tempting to take a souvenir, like a lightbulb, rock, or chunk of wall. As in the point above, resist the urge–make sure you leave the site for others to explore. 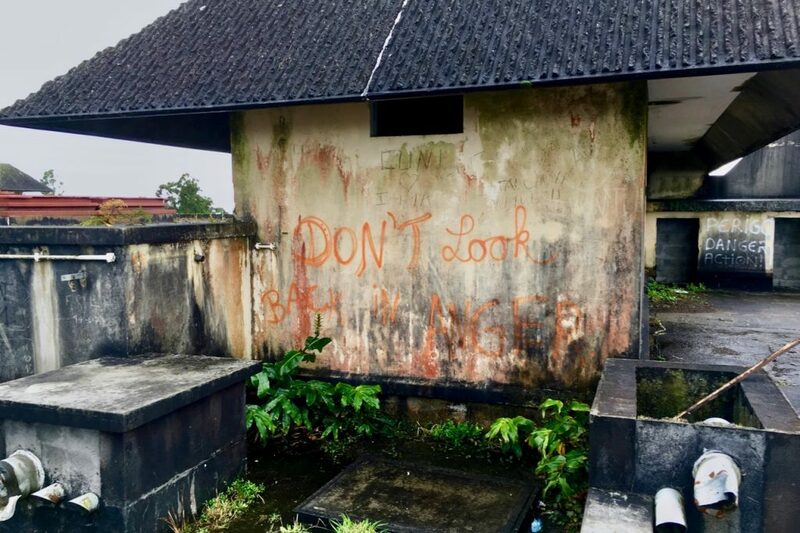 If you’re interested in trying out urban exploration, check out the top ten cities for it, and be sure to read these additional guidelines. 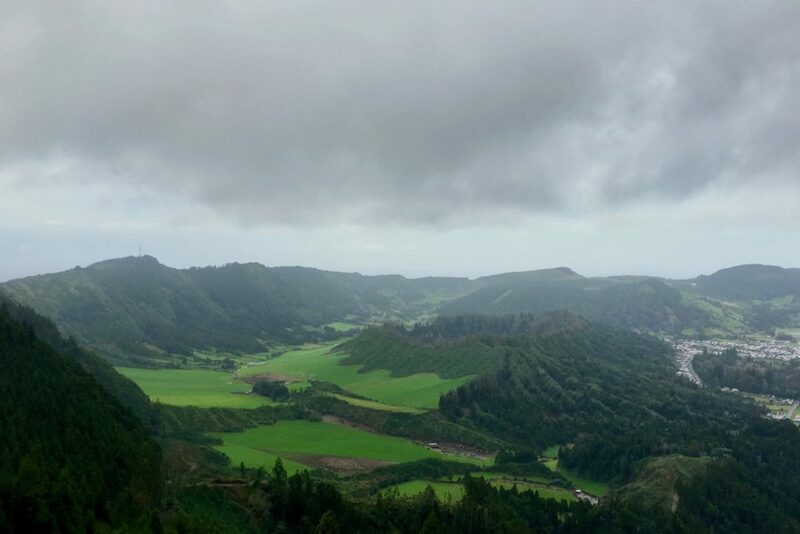 We found it completely by chance on a hike from Sete Cidades. 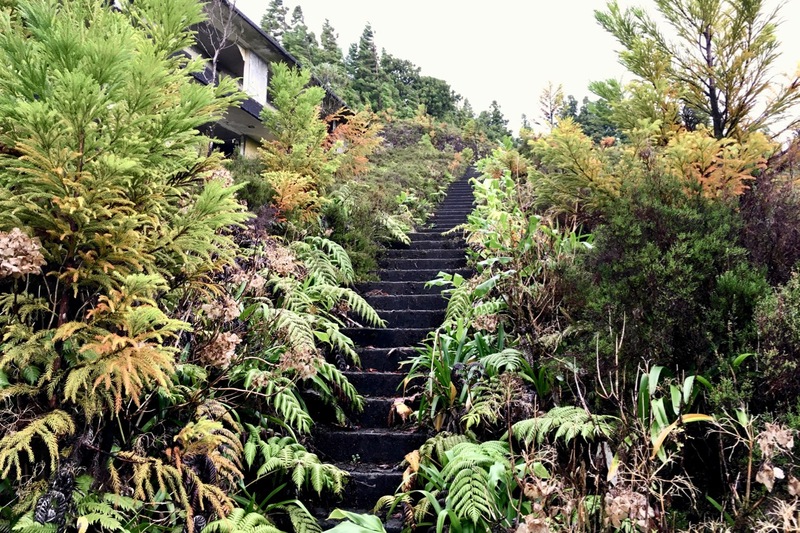 The trail starts in town at the bottom of a volcano and you hike up to the rim of it. When we reached the rim, the hotel was only 500 feet from the trail. 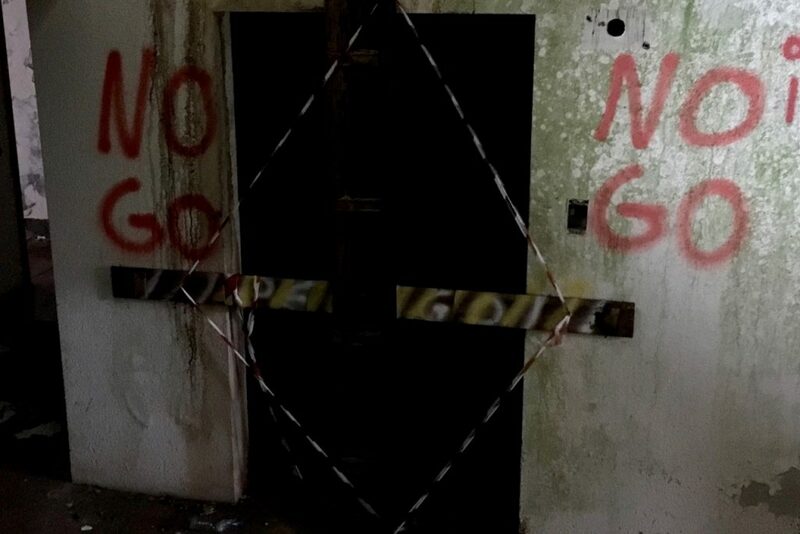 There were no signs to tell us to keep out, so we went exploring.